Principles of fractures management is the key element of this sqadia.com medical video lecture. All the methods of managing the fracture are described in this lecture ranging from closed reduction, open reduction, methods of holding reduction, continuous traction along with traction method. Alongside, cast splintage, functional bracing, internal and external fixation are comprehensively elaborated. Lastly, comments are also given on management of open fractures and gunshot injuries. Reduction should aim for adequate apposition and normal alignment of the bone fragments. There are two methods of reduction i.e. closed and open. In closed reduction, the fracture is reduced by a three-fold manoeuvre. For some muscle’s, traction is needed because of strong muscle pull. Open reduction or operative reduction is indicated when closed reduction fails regardless of the reason. Continuous traction, cast splintage, functional bracing, internal ﬁxation, and external ﬁxation are the methods of holding reduction. Carrying on with the discussion, contraindications to non-operative methods are described. Continuous traction is also used for acetabular fractures with femoral head subluxation. Traction by gravity, skin traction, and skeletal traction are the traction methods. After the fracture has been reduced, the technique of cast splintage is used in which stockinette is threaded over the limb and the bony prominences are protected with wool. Its associated complications are also presented. Functional bracing is one way of preventing joint stiffness while still permitting fracture splintage and loading. 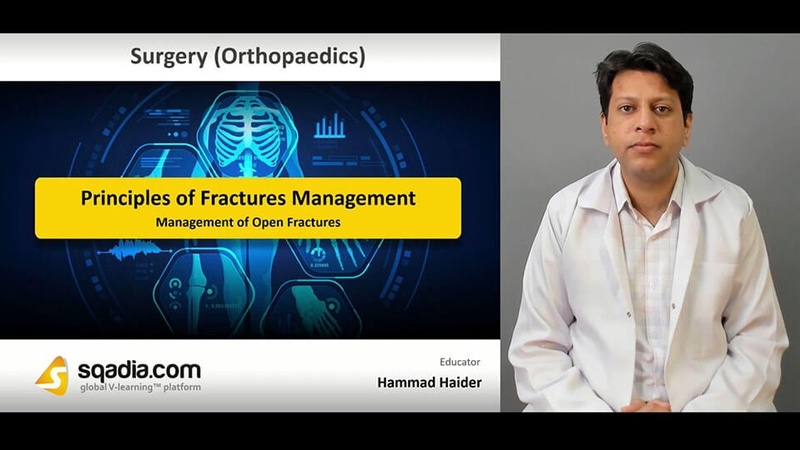 Dr. Hammad Haider also elaborates the technique of functional bracing. Internal fixation holds fracture securely. Internal fixation is indicated for fractures that cannot be reduced except by operation. Interfragmentary lag screws, and, plates and screws are the types of internal fixation. Likewise, external fixation has also been brought into debate. It is used for fractures of femur, humerus, distal radius. External fixation is indicated for fractures associated with severe soft-tissue damage. Initial management of open fractures is the wound inspection. Then Gustilo’s classiﬁcation of open fractures is given. 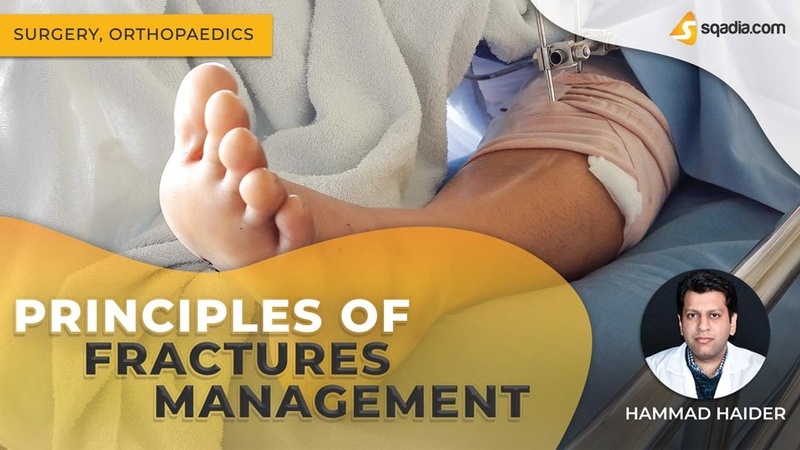 Orthopaedic surgeon sheds light on four essential principles of treatment. Following this, information about antibiotics for open fractures is given. Discussion continues on debridement. Sequels to open fractures are pursued later on along with gunshot injuries. Emergency treatment is the arrest of bleeding. Dr. Hammad Haider also notify about definitive treatment of low-velocity wounds and high-velocity injuries.